Tribal groups in Peru have filed a lawsuit against the government for allowing US energy company carry out exploration activities in their ancestral land. 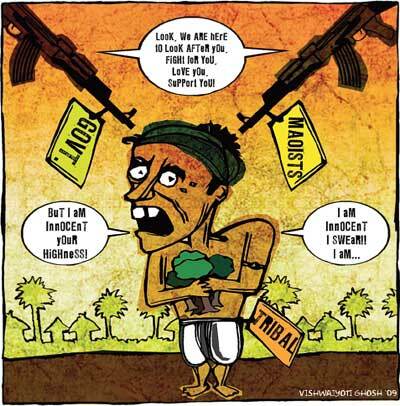 Representatives of the tribes said Hunt Oil is looking for crude reserves in the Amarakaeri Communal Reserve, which is a protected ancestral land of Harakmbut, Yine and Machiguenga tribes as per the constitution. The groups also filed a lawsuit against the company. The government contended the tribes control only surface rights of the reserve, while the government can lease subsoil mineral rights to foreign companies. The reserve, known as block 76, is one of dozens of blocks that Peru has auctioned in recent years to become a net petroleum exporter. Iran has run into a showdown with Western countries after a satellite image revealed a uranium enrichment facility in Qom province. Tehran insists the facility is strictly for research and energy production. 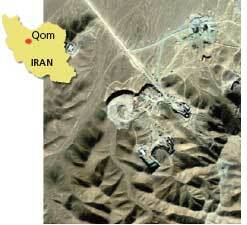 Western countries fear Iran may be enriching uranium for nuclear weapons. In the last week of October, the UN offered Tehran a proposal to convince world leaders send the uranium stockpile to Russia for 20 per cent enrichmentuseful for energy purposes but well below the level of enrichment required in weapons. The fuel would then go to France to be turned into fuel rods and returned to Iran by the end of 2010. Tehran said it would accept the deal but with a few changes the stockpile would be sent abroad gradually, a nd it needs a simultaneous exchange of nuclear fuel in return. The World Health Organizations plan to start distributing swine flu vaccine to 100 developing countries may get delayed due to a supply crunch. The global body had urged a US-led group of rich nations to donate 200 million vaccine doses. But the US said it would not donate the vaccine until at-risk Americans such as pregnant women, heathcare workers and children have been inoculated. The US Centers for Disease Control and Prevention (cdcp) said there is not enough H1N1 vaccine available in the country. It has received 23 million doses against the demand for 250 million doses. Since the H1N1 vaccine is difficult to grow, it has caused a delay in production and a shortage of vaccine, cdcp officials said. It could be widely available in December. In the face of a four-year drought, Californias energy regulators find it hard to harness solar thermal power. Water is becoming a contentious issue as the government aggressively promotes solar energy in the Californian deserts. Solar power plants need millions of litres of water to produce steam, drive turbines and keep the power plants cool. But California has a dwindling water supply, said the energy commission. Its worries heightened recently after Pacific Gas and Electric announced it would build two solar power plants with a combined capacity of 500MW in California. The plants would need 5,000 million litres of water annually, sufficient to meet the water requirement of a town of 150,000 families. Another 35 big solar plants are in the pipeline. After years of struggle, the Australian government returned an entire national park in the state of Queensland to its traditional owners. Sustainability minister Kate Jones visited the aboriginal town of Kowanyama on October 22 to hand over the ownership of the 37,000 ha Mitchell-Alice Rivers National Park to the Oykangand and Kunjen people. They renamed it Errk Oykangand National Park. 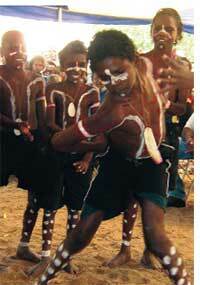 Aborigine leaders said the transfer is the legal recognition of their ownership. The Queensland government had established the national park in 1970 without their consent. Abuja is mulling an oil reform bill following a lucrative offer from China, about US $50 billion for acquiring six billion barrels of crude oil reserves in Nigerias 23 oil fields. The proposed petroleum industry bill would allow the government to renegotiate old contracts, long-owned by Western oil companies such as Shell and Chevron, impose higher duties on oil companies and retake blocks that the oil firms are yet to explore. European oil giant Shell, which produces 40 per cent of Nigerian oil, said it would fight any possible efforts by the Nigerian government to hand over control of its fields to Chinese oil companies. Prime Minister Vladimir Putin has warned that natural gas deliveries to Europe might again be disrupted this winter as another payment row between Russia and Ukraine is in the making. Ukraine which depends on Russia for most of its energy needs has not paid two months of gas bills, about US $12 billion, to Russias state-owned energy giant Gazprom. This is despite US $25-billion assistance from International Monetary Fund to modernize its gas transit system, Putin said. He also criticized the European Commission for refusing to extend loans to Ukraine to cover its gas purchase. 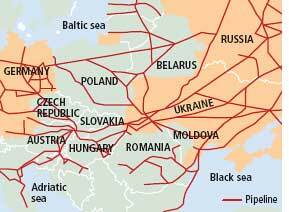 Russia supplies a quarter of EUs gas needs; 80 per cent of this is pumped through Ukrainian pipelines. A similar dispute had resulted in a supply cut-off to eastern and central Europe for two weeks in January. Russia had said Ukraine is not paying for the gas and diverting gas exported to the EU from the pipelines. Venezuela, a country where natural gas is cheaper than water, is facing chronic energy crisis. President Hugo Chavez blames it on increased demand and low rainfall affecting the hydroelectric dams that generate 70 per cent of the countrys power needs. Chavezs critics link it to poor maintenance of transmission lines and power plants. The countrys power consumption has risen 25 per cent since 2004 when it enjoyed an oil boom and electricity rates were frozen. But the government did not invest in expanding power production. Chavez has announced measures to curb energy use, asked government departments to reduce consumption by 20 per cent. He created a new electricity ministry and plans to fine those who consume more. Scientists have confirmed that the 60km rift formed in Ethiopia in 2005 following two volcanic eruptions is the beginning of the making of a sea. The volcanic region in the Afar desert sits on the boundary of the African and Arabian tectonic plates, which have been gradually spreading apart for millions of years, said researchers led by Atalay Ayele of Addis Ababa University in Ethiopia. An oil rig in the Timore Sea off Australia leaking thousands of barrels of oil for 10 weeks has been plugged. A massive blaze on the West Atlas rig has also been put out, said the rig operator pttep Australasia. Experts plugged the leak on their fifth attempt by injecting 3,500 barrels of mud into the well. Green group wwf said the oil slick now covers 15,000 sq km of the sea and endangers marine life. The company said it may take seven years to clean up the slick. The global economic crunch has hit Cubas most famous export, cigars, forcing the island country to slash tobacco production. The government said recession and spread of smoking bans has affected sales; the land devoted to growing the crop has therefore been cut down by over 30 per cent this year. As the crop drops, the government said it would affect at least 200,000 farmers who make a living by growing and curing tobacco and tens of thousands of Cubans who work in factories handrolling tobacco into cigars. Premium brands such as Cohiba and Romero y Juliets dominate the world market.